1) Rub trout fillets with lemon halves to coat. 2) Mix together cornmeal, flour, salt, and pepper in a medium bowl. Whisk together milk and egg in another medium bowl. Dredge trout in cornmeal mixture, shaking off excess. Dip into milk mixture, and dip into cornmeal mixture again. 3) Melt butter in a large skillet over medium heat. Add trout and cook until golden brown on both sides, turning once, about 5 minutes total. 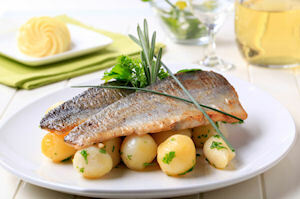 4) Pour honey over fish in skillet; lower heat to low, cover, and cook 4 minutes. Serve immediately. Summary: While an unusual ingredient for fried fish, honey really makes the flavors of golden trout pop.